In true Grateful Dead spirit, we want to do all we can to insure that actual fans are in attendance, not scalper clients. Therefore, we have established a 2-ticket per person limit, and decided to offer Will Call tickets only (so if you hear or see anyone trying to sell hard tickets, they're bogus -- please spread the word). Only the person actually purchasing the tickets will be able to pick them up at the venue (NO I.D. = NO ENTRY), and there will be *NO REFUNDS* (exchanges allowed at the door as long as the person picking up the tickets provides a photocopy of purchaser's driver's license and credit card used to make the purchase, along with a note from the purchaser authorizing them to receive the tickets...so please plan accordingly, as there will be no exceptions). 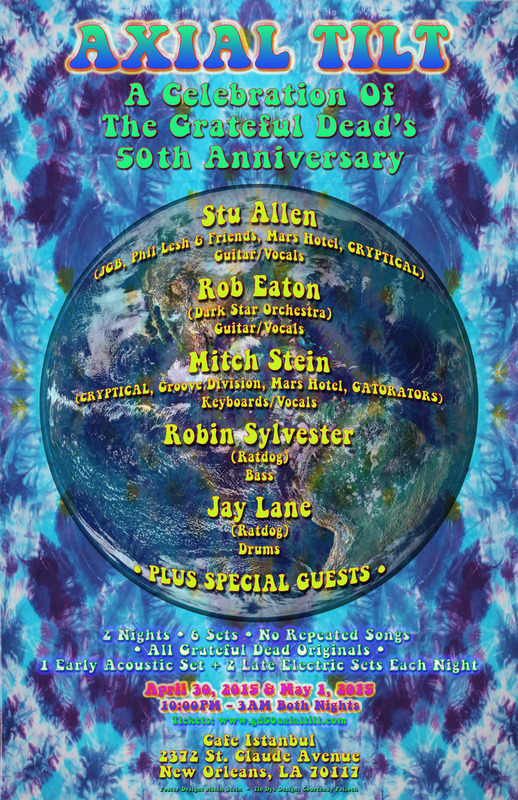 We are thrilled to have the opportunity to kick out the Grateful Dead jams in New Orleans in celebration of the band's 50th Anniversary, and hope you can join us (and if for some reason you can't make it, we hope you'll join our 2-night webcast and celebrate with us virtually: AXIAL TILT Webcast)! NOTE: This is a 2-night event, so the ticketing system will automatically list the first night (April 30, 2015) on the order page. If you're purchasing ONLY a Friday ticket, please confirm that the checkout page clearly lists "Friday Show Ticket: 5/1" on your order summary before checking out. As long as your ticket says "Friday Show Ticket: 5/1", you're good to go.